ANTHONY JOSHUA has vowed to go all guns blazing into his fight with Carlos Takam - just like he did at Wembley to stop Wladimir Klitschko. Asked what he might alter after his most famous win, the IBF, IBO and WBA 'super' heavyweight champion said: "Nothing. That's why everyone is here - because they want to see fights like that again. "We're going to have a war, we're going to wear our hearts on our sleeve. When people come to see me box, they know they are going to see knockouts and a bit of blood, and a bit of respect after. That's what boxing is about. I'm a wholesome fighter, I've got that roughness in me. When I need to dig deep and the skills aren't working, I know I can pull it out of the bag." And former Heavyweight champ Frank Bruno can't see Joshua wanting to hang around in the ring. "It is who wants it more and I can see AJ walking through him. 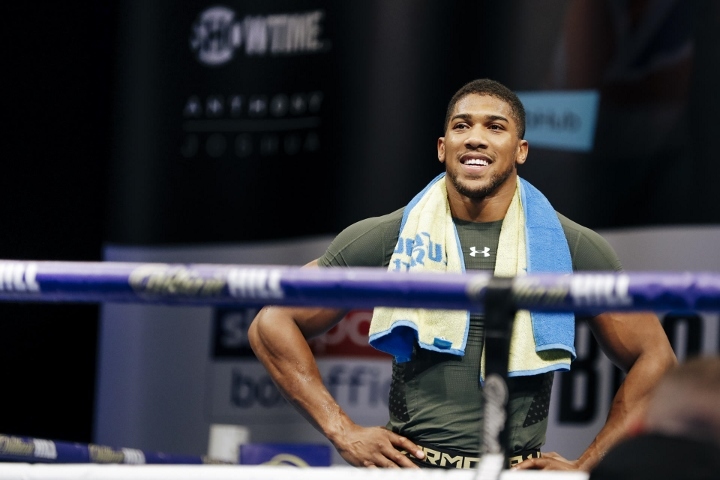 "I can't see him giving AJ much problems, if AJ is up for it. It should be a good fight while it lasts." Bruno reckons former heavyweight kingpin Tyson Fury and a unification clash with WBC champion Deontay Wilder would be far tougher tests for Joshua. He said: "Tyson Fury would give him a run for his money. He's got a lot of bottle, he's not afraid. "Deontay Wilder is not as polished as Joshua who works on his movements. Wilder is a wildcat, but he's a wildcat that can punch. "But my money is on AJ - he's on his game and is very, very determined, very focused, very fit, and wants to get better all the time. "He will mature, and has more to achieve and is on his game all the time." Wise words from Frank, good to hear he is clearly doing well now. [QUOTE=Kigali;18163107]...but wilder is faster and won't get tired. [/QUOTE] Can't polish a turd. Amiright,sh*tskull? [QUOTE=larryxxx. ;18162843]Joshua is the more skilled boxer[/QUOTE] ...but wilder is faster and won't get tired. [QUOTE=Slyboots;18162654]As much as I would want Wilder to win, I gotta agree here. [/QUOTE] Slow,easily tired,and more polished won't win. I would be shocked if Joshua beats Wilder.